Dozens of crates and carriers used to help sick and injured animals were found missing from Ziggy's Legacy Rescue in Brooksville on Thursday morning. BROOKSVILLE, Fla. — Dozens of crates and carriers used to help sick and injured animals were found missing from Ziggy's Legacy Rescue in Brooksville on Thursday morning. "We had them stacked here," Mandy Figarola, who runs the rescue, said. Figarola says the crates and carries are used to help rescue dogs like Dakota, who was in bad shape a couple of weeks ago when she came into Hillsborough Animal Services. "Something about her just made me send an email immediately and we sent someone over to get her," said Figarola. She runs the rescue at her husband's clinic, ASAP Animal Clinic. "We take mostly the medically needy ones," said Figarola. They use the crates all the time while the animals heal. "We use them for rehabilitation, we give them to foster homes, use them here for surgery days," said Figarola. They're also used to help dogs like Trigg socialize and dogs like Dakota get adopted. Figarola says they store the crates back behind the clinic, but this morning they were gone. "It’s probably not the smartest place because it is outside but my brain just doesn’t go to the place where people would take things that don't belong to them," said Figarola. 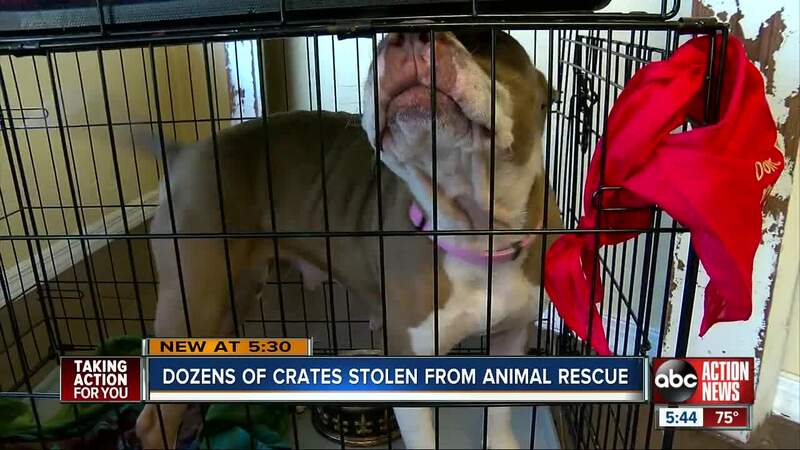 Figarola says she doesn’t know why someone would steal more than two dozen crates from a rescue. "I hope they needed them for something. I hope if they’re going to sell them that its to feed their children and not to buy drugs," said Figarola. If you want help or are interested in adopting contact Ziggy's Legacy Rescue on their Facebook Page.